Titanium is famed for its beauty, light weight and extreme toughness. While originally used in the creation of tools, it is making its way into various other parts of our lives as well. This includes pieces of jewelry and accessories, such as watches, bracelets, earrings, money clips and more. Additionally, it is becoming more common to find titanium wedding bands. Titanium wedding bands are classy, stylish and unconventional in their design. Plus, it is a metal that suits men and women alike. Moving away from traditional gold and towards modern titanium is a statement about your individuality. Before you go out shopping, however, there are a few things you must take into consideration. As titanium becomes more popular, it is also changed slightly to make it even more unique. One new type, therefore, is black titanium. Unfortunately, while titanium is known for its hardness, black titanium will frequently scratch and may therefore not be suitable for jewelry that you wear every day. 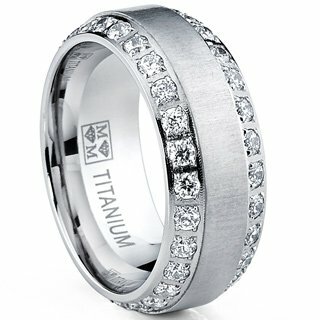 A lot of people like to combine their titanium wedding ring with another precious metal, most notably gold or platinum. If this is something you are considering, you must know that your wrong will be a lot more expensive. This is because it is very hard to work with titanium due to its hardness, so you will have to pay a significant amount for the craftsmanship as well. Some jewelers seem to struggle with sizing titanium rings properly. This is why you must only go to a properly qualified jeweler. You must also remember that it is almost impossible to have a titanium ring enlarged or narrowed. So, you will have to make sure that your weight stays pretty stable for the duration of your married life. If the ring ever has to be cut, for instance after an accident, then it is unlikely that it can be fixed again. Unfortunately, titanium is simply not a pliable metal, which is precisely what gives it its strength. Hence, once broken, it will remain broken and all you will be able to do is replace it. While titanium is very durable, it will show some wear and tear signs. Some people find it becomes slightly scratched in certain places. The likelihood of this happening and the extent at which it will happen depends on the quality grading of the titanium itself. Titanium is a high luster metal. This means that if it does start to appear slightly dull, a little bit of polish will immediately restore it to its original shine. Titanium is not suitable for people who have a conservative or traditional taste. However, if you want to get the best of both worlds, you could opt to have a titanium wedding band with a gold inlay, thereby offering both tradition and modern beliefs. If you are getting married, considering titanium is a great way to break the mould.